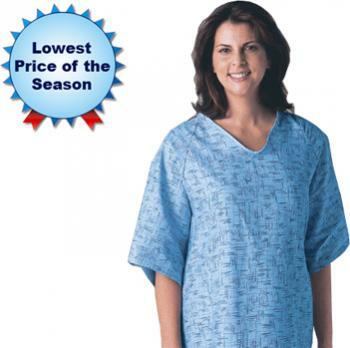 Your Medical Facility will look professional and your patient will be fully covered front and back Our Cascade gown is able to accommodate facilities that need an economical, deluxe cut gown. This gown is constructed of 4.1 oz. twill fabric and has a tieside closure to provide complete patient modesty. The gown is cut with a full 66'' sweep and feature a raglan sleeve for extra room. Patients will appreciate the 49'' length and 7'' in-sleeve. Neck and waist ties are made of durable, 100% polyester twill tape and reinforced to the body of the gown for added durability. These gowns are also LATEX Free. Linen managers and purchasing officers why are you paying 0.50 to 0.60 cents a day to rent these gowns, when you can buy them for much less. ON SALE BY THE DOZEN.